Campbell Soup Company (CPB) beat the consensus estimate on Q4 earnings, but missed on the top line. The company also announced its plans to sell its international and fresh-foods units. The revenue miss and the divestiture of the two units resulted in the stock falling down more than 3% in the pre-market trading hours. Campbell reported a 33% increase in sales to $2.21 billion for the fourth quarter of 2018 versus the same period last year, reflecting benefits from the Snyder’s-Lance and Pacific Foods acquisitions. Organic sales fell 3% mainly due to declines in Americas Simple Meals and Beverages. 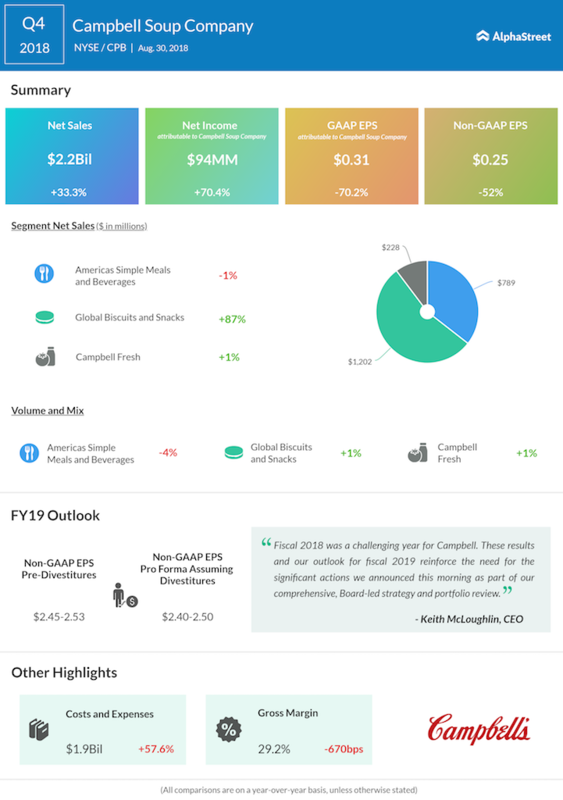 Net earnings attributable to Campbell Soup Company declined sharply during the quarter to $94 million or $0.31 per share from $318 million or $1.04 per share in the prior-year period. Adjusted EPS came in at $0.25. For the full year of 2019, excluding divestitures, the company expects net sales to come in the range of $9.9 billion to $10.1 billion while adjusted EPS is expected to be $2.45 to $2.53. Assuming the divestitures take place at the beginning of the year, net sales are projected to total $7.9 billion to $8 billion and adjusted EPS is expected to amount to $2.40 to $2.50. Sales in the Americas Simple Meals and Beverages segment dropped 1% hurt by weakness across its soups business. In Global Biscuits and Snacks, sales jumped 87% helped by the Snyder’s-Lance acquisition and gains in Pepperidge Farm cookies. Sales of Goldfish crackers were hurt by the product recall last month. Campbell Fresh segment sales grew 1% helped by higher sales of Garden Fresh Gourmet. In Q4, Campbell achieved $30 million in savings under its multi-year cost savings program, bringing total savings to-date to $420 million. As part of its strategy and portfolio review, Campbell announced its decision to sell the Campbell International and Campbell Fresh business units and to focus more on the Campbell Snacks and Campbell Meals and Beverages core North America businesses. The proceeds from the sales will be used to reduce debt. Campbell has been struggling to revive sales in its soups business which has seen continuous declines, and has also been facing pressure from activist investors who have been pushing for a sale of the company in light of the continued weakness. As part of the new strategic decisions, Campbell has raised its cost savings target by $150 million. On the whole, the company’s total cost savings target now stands at $945 million by the end of fiscal 2022. Over the long term, Campbell expects to achieve organic net sales growth of 1% to 2% along with adjusted EBIT growth of 4% to 6% and adjusted EPS growth of 7% to 9%.